On Friday, January 13th we hosted the 4th Annual 100 Black Men Strong Event. 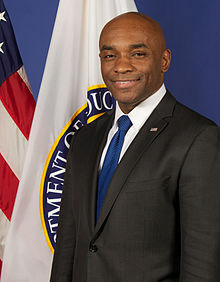 James Cole who is the U.S. Department Deputy Secretary of Education oversees a broad range of operational, management, policy, legal and program functions at the Department. Cole also oversees the Department's work on President Obama's My Brother's Keeper Task Force, which seeks to address persistent opportunity gaps faced by boys and young men of color, and to ensure that all young people are able to reach their full potential. Each year, The Black Male Achievement Team at Patrick Henry High hosts our 100 Black Men Strong Event. This event seeks to bring 100 + Black male professionals to Patrick Henry to speak with our Black male scholars about college, career and life readiness goals. This event is possible through partnerships with "Minneapolis Public Schools Office of Black Male Student Achievement" and "Minneapolis Public Schools Department of Career and College Readiness." Our professionals are expected to engage our scholars in focus conversations around a topic as it relates to college, career and life readiness. Scholars and professionals are intentionally matched with each other by profession.